Strawberry plants have a very unique diversity when it comes to their genetic makeup. The genetics of most things are relatively complex, but the genetics of strawberry plants throw an additional twist into the mix. Strawberry plant species have varying numbers of chromosomes (see the Strawberry Plant page for introductory information). Most species are diploid, meaning they have two sets of chromosomes, one set of chromosomes is normally inherited from each parent. Polyploidy, a condition more common in plants, occurs when multiple pairs of chromosomes are present in the genetic component of an organism. Strawberry species and hybrids can be diploid, tetraploid, pentaploid, hexaploid, heptaploid, octoploid, or decaploid (having 2, 4, 5, 6, 7, 8, or 10 sets of the seven strawberry chromosomes, respectively). Use the sortable table below to see a list of the polyploid genetics of strawberry plants. The various major species of strawberries are listed, along with their genetic makeup and informational notes. For more information, see the Strawberry Varieties page. Diploid 14 Fragaria daltoniana Himalayas Its fruit has a poor flavor, and it is of no commercial value. Diploid 14 Fragaria iinumae Japan, Eastern Russia Was first discovered in Japan on Mount Nōgōhaku (能郷白山, Nōgōhaku-san) and was given the name Nōgō Fragaria (ノウゴウイチゴ・能郷苺, Nōgō Ichigo). Diploid 14 Fragaria nilgerrensis Southern Asia, Southeast Asia Its fruit has a poor flavor, and it is of no commercial value. Diploid 14 Fragaria nipponica Western side of the Japanese island of Honshū, Japanese island of Yakushima Fragaria nipponica, particularly var. yakusimensis, is cultivated in Japan for its edible fruit. Some botanists treat it as a synonym of Fragaria yezoensis. Diploid 14 Fragaria nubicola Himalayas This strawberry species is of no commercial value. Diploid 14 Fragaria vesca Northern Hemisphere Other names for this species: Fraises des Bois, Wild (European) Strawberry, European Strawberry, Woodland Strawberry, and Alpine Strawberry (the latter is the most common type in cultivation, which usually is nearly always everbearing, and produces few runners). Diploid 14 Fragaria viridis Central Asia, Europe It has extremely small berries, fine flavor, surprisingly little of the usual strawberry aroma, but a refreshing acidity. They sometimes ripen without becoming red. 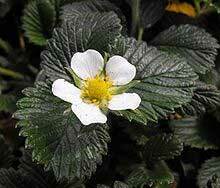 Diploid 14 Fragaria yezoensis Northeast Asia It is of no economic value. Tetraploid 28 Fragaria moupinensis China Its common name is xi nan cao mei. Tetraploid 28 Fragaria orientalis China, Mongolia, Russia Its common name is dong fang cao mei. Pentaploid 35 Fragaria × bringhurstii West Coast of the United States This species results from the natural crossing of Fragaria vesca and Fragaria chiloensis, native species whose ranges overlap. This species receives 7 chromosomes from the F. vesca parent and 28 from the F. chiloensis parent. The odd number of chromosomes causes limited fertility due to problems of chromosome pairing during meiosis. The plants readily reproduce vegetatively through runnering, however. Hexaploid 42 Fragaria moschata Europe Also known as the musk strawberry. Its French name "hautbois" strawberry is anglicized as "hautboy" strawberry. Heptaploid 49 Fragaria x Comarum hybrids The first-generation hybrids receive four sets of chromosomes from their octaploid strawberry parent and three from their hexaploid Comarum parent. The commercial hybrids most resemble strawberries and include: 'Franor' (aka 'Red Ruby'), 'Pink Panda' (aka 'Frel'), 'Gerald Straley', and 'Lipstick' Strawberry. Octoploid 56 Fragaria × ananassa A hybrid species that is cultivated worldwide The "common strawberry." The fruit is widely appreciated, has a characteristic aroma, bright red color, and juicy texture. It is consumed in large quantities. Octoploid 56 Fragaria chiloensis Pacific Ocean coasts of North and South America and Hawaii Also known as the beach strawberry, Chilean strawberry, or coastal strawberry. Octoploid 56 Fragaria chiloensis subsp. sandwicensis Hawaii Also known as the Hawaiian strawberry or ʻōhelo papa. Octoploid 56 Fragaria iturupensis Iturup, Kuril Islands It has relatively large berries for a wild species, which are similar in appearance to those of Fragaria virginiana. Octoploid 56 Fragaria virginiana North America This species is also sometimes called "Wild Strawberry" or "Common Strawberry", though this can also refer to several other species of Fragaria, particularly F. vesca. Recognized subspecies are: glauca, grayana, platypetala, virginiana. Decaploid 70 Fragaria x vescana Unnatural hybridization between Fragaria × ananassa and Fragaria vesca This species is not yet commercially important, but it remains under development. Its berries are flavorful but small. Strawberry plants are surely a wonderful creation. If interested in the genetics of strawberry plants, why not do a few of your own breeding experiments? You can get an idea of what is required to develop a new strawberry variety and then get busy growing strawberries yourself! And, even if strawberry genetics are a bore to you, you can always simply enjoy eating your fresh-picked strawberries! I was told in a college botany class (20 years ago) that the polyploidy nature of strawberries is what gave it its size and extra flavenoids and vitamin C.
It is indirectly true in that the genome dictates essentially all characteristics of an organism as the methyl components of the helix structure contribute to the expression as the DNA is transcribed and traits are expressed in reproduction/replication. However, both F. virginiana and F. chiloensis are octoploid. F. virginiana yields quite small fruits and contains varying bioflavenoids when compared to the white, larger F. chiloensis. 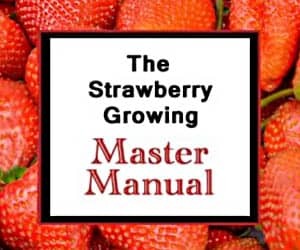 The major factor in yielding the increased size of today’s strawberry varieties is intensive and selective development programs, not necessarily that the strawberry plant is polyploid. Hope that helps!